At the farmers’ market a couple of weeks ago, I picked up two butternut squash that were each about the length of my hand. 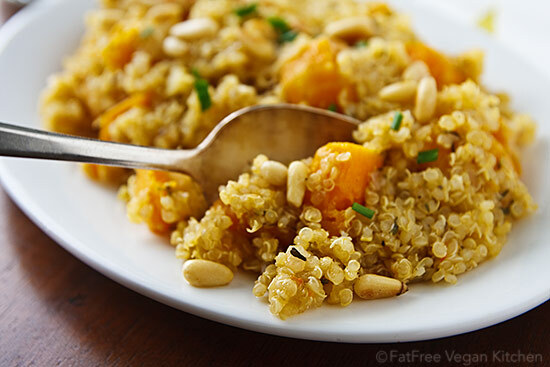 Since I love roasting butternut with a touch of lemon, I was considering cooking them in that tried and true (but unimaginative) manner when I got the idea to roast one of the squash and mix it in with my favorite grain/seed, quinoa. The results were a light and lemony side dish that goes with practically anything. 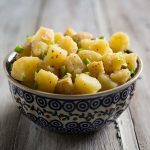 I served it with baked tofu, gravy, steamed broccoli, and a salad for a sort of traditional American meal, but the lemony flavor makes a great accompaniment to everything from Thai food to Italian. I’m considering making it a part of my Thanksgiving dinner this year. The pine nuts really complement the lemon flavor, but if you decide to leave them out, you can deduct about 30 calories and 3 grams of fat per serving. Preheat oven to 400F. Cut the squash in half and scrape out the seeds and strings (using a grapefruit spoon makes this easier). Peel and cut into 1/2-inch cubes and toss with the 1 teaspoon of lemon juice. Place them on a non-stick baking sheet (or silicone mat), sprinkle with a little salt and pepper, and bake for 15 minutes, stirring halfway through. Place the quinoa in a fine-mesh strainer and rinse it well and allow to drain. Heat a deep, non-stick pot. Add shallots and garlic and cook, stirring, until shallots soften slightly. Add the quinoa and toast it until it has dried out and begins to exude a toasty aroma. Add the squash along with the thyme and vegetable broth. Reduce the heat to low and cover. Cook, stirring once or twice, until all broth is absorbed, about 20 minutes. Stir in the lemon peel and 1 tablespoon of lemon juice. Season to taste with salt and pepper, and add more lemon juice if needed. What a great recipe!! We just made it for Christmas Dinner. Lots of taste and easy to make! This looks fantastic! 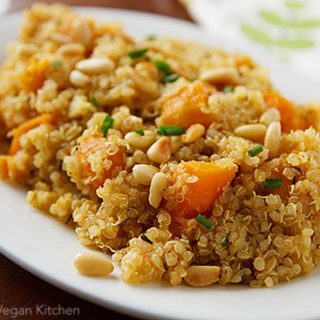 I recently made a butternut squash risotto that I can't get enough of, and quinoa sounds even better. 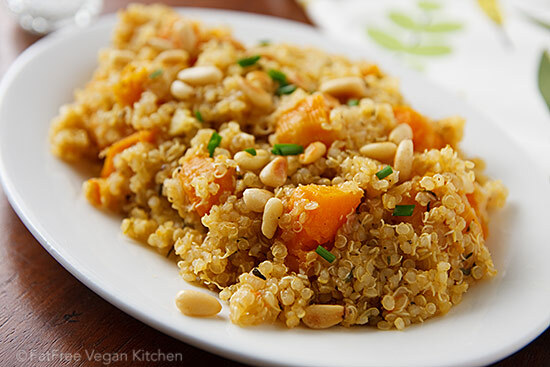 The pine nuts also sound like a perfect complement to the quinoa…I'm going to have to go back to the store for more squash! Tried this last night…TERRIFIC!!! It was easy to put together and the lemon really set it off! My husband ate it and liked it…(he couldn't care less about healthy eating) Thanks for your blog! This is my first time using butternut squash. I absolutely loved this recipe. I loved the lemon flavor and the toasted pine nuts were a great addition to the overall dish. This will be a common meal from now on. One of my favorites. The only thing I did differently was to steam some broccoli and mixed it in. This looks delicious! 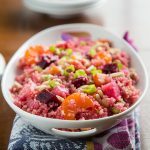 I love quinoa and will certainly add this to my must-make list. Thanks! Granted the feta isn’t vegan…but you could skip it and this would still be very yummy! Perhaps replace it with olives or tofu. Thanks for this lovely recipe. I loved the (really really) lemony taste! I cooked it this evening but only took a mobile cam pic because I had to devour it immediately. This was soooo good! Wow! This recipe was SO delicious, and simple too! I didn’t have a fresh lemon, so no lemon peel, but I added a little lemon pepper with the lemon juice, and that seemed to do the trick. 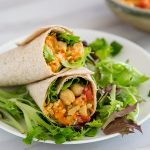 I’m not a vegan, but I will be coming back to your site to try other tasty recipes! Thank you! Oh, this was MOST Delicious! I used red quinoa- which made the dish even more colorful, and waited to add squash until quinoa was cooked. This was easily the BEST quinoa dish EVER! Thank you so much for this recipe and for many other you so generously share here! I made this for My Love and I tonight for dinner. I didn’t add the pine nuts but I don’t think it lacked in taste for it. 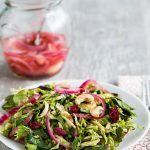 We absolutely loved this recipe and we intend to have it many times..and in the summer we thought having it cold as part of a picnic might be nice. This recipe is amazing! The lemony quinoa is fantastic—I love it really, really lemony. Also before I was always making butternut, acorn, etc. by cutting it in half and baking it. It turns out much less flavorful that way. The method of cubing it and squeezing pepper and lemon over it makes it outstanding! Thanks so much for all of these awesome recipes. I made this last week. It was easy, and it was a home run. My wife (who tolerates my vegan eating and is normally less than enthusiastic about these sorts of dishes) thought it was one of the best we’ve ever had. Note: We served it with tamari-baked tofu and mushroom gravy. This made quite a robust meal. Highly recommended. I made this today and it’s absolutely delicious. I added some fresh basil (b/c the plant sits on my counter), but didn’t have pine nuts on hand. The flavors balance perfectly and this will definitely be a go-to recipe when I have squash in the kitchen. Thank you! This recipe is delicious. I’ve made it twice now, first time, following your recipe exactly. This time, I upped the thyme to 1.5 tsp and added a few shakes of Mrs. Dash at the same time. I also didn’t have any fresh lemon on hand, so I used lemon juice, but added zest of orange instead. Oh, and I just realized that I only used 2 cups broth this time instead of 2.5 and it still turned out amazing. Just made this for Thanksgiving. It didn’t work for me. I think it’s the lemon – the whole thing just tastes sour. Oh well. This looks great. I am having a couple friends over for dinner tomorrow night and I think I will make this. What else could I make that would go well with this? Thanks! I mistakenly bought butternut squash instead of spaghetti squash for another recipe. So I made this instead in a simplified version (things must be super easy for me to attempt them) of whatever I had in the house … onions instead of shallots, whole baked squash, pre-made quinoa, and just the garlic, lemon, thyme, and a little salt & pepper. It’s yum! I never would have thought of adding garlic and/or thyme to squash, plus the lemon. So good! And healthy. Thank you Susan! Just ate this for lunch – so delicious light and filling. Great recipe! Fabulous recipe! Just made it tonight. Love the lemony flavor…but it isn’t overpowering at all. We visited a local farm last week and purchased MANY different kinds of squashes, gourds and pumpkins. So glad I found this recipe. I made this last night with some baked tofu and it was really delicious. As you mentioned, it would work well as a Thanksgiving side as well. I made this yesterday for a vegetarian thanksgiving potluck. I was looking for a last minute recipe and I stumbled across this on fb, I had all the ingredients so I decided to give it a try. I made double the recipe. During the cooking stage, there was so much liquid I had to take the cover off after 30 min in hopes that it would evaporate. It eventually did but all the roasted veggies and quinoa turned into a big mash. I added some extra toasted almonds at the end to try and salvage some texture and my friends still liked it but I would recommend using way less liquid than 2.5 c to 1 c quinoa. I was out of quinoa so I substituted a very nice gluten free wild rice which I par cooked before adding it into the large pot with all other ingredients. This was a smash and we all loved it. I served it on a bed of wilted romaine (fresh from my organic garden) topped with toasted organic raw pumpkin seeds as I am a vegan and this is a main dish for me. Yumm! I plan on trying with the quinoa next week. Thanks for this delicious way to utilize healthy squash!